Cade Brennan is one of the best defensive ends in the area. Cade Brennan is a little tough to miss. 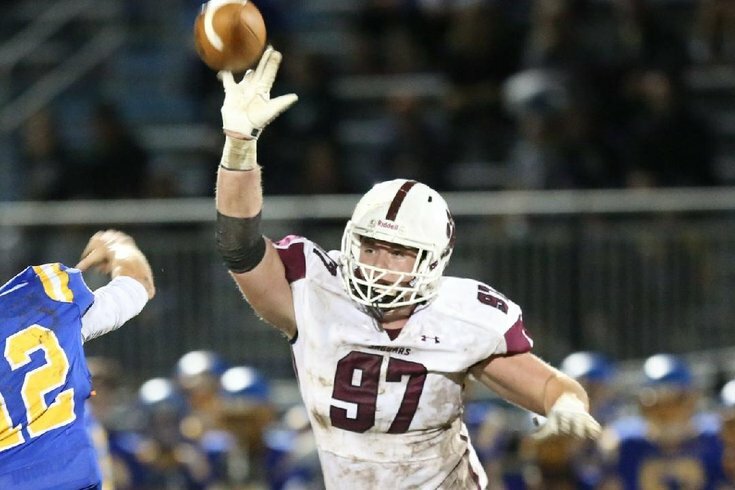 He’s a 6-foot-4, 255-pound senior defensive end for Garnet Valley and plays as much with his mind as he does his muscle. Brennan and the undefeated Jaguars have a titanic test tonight, when they visit undefeated Coatesville in the PIAA District 1 Class 6A semifinals at 7 p.m.
What will invariably happen early in the game — and what’s happened throughout the season — is Garnet Valley defensive coordinator Jeff Allison and defensive line coach Jeff Hill will ask Brennan what he sees on the field, and the Jags’ coaching staff will make adjustments accordingly. That’s how much impact Brennan has had on this 12-0 team. It’s why the highly intelligent Brennan is heading to Bucknell. “Coach Allison always approaches Cade as he comes off the field and asks, ‘What do you see, what do you like?’ and the feedback Cade gives us is tremendous,” Jags’ head coach Mike Ricci said. “That’s how much faith and confidence we have in Cade. Brennan worked into becoming an impact player. Ricci was impressed with how Brennan adjusted to the high school varsity level these last two years. He got stronger and makes his teammates better through his example. Brennan’s resilience is at the heart of the Jags’ resolve. That will be challenged tonight against Coatesville, which beat the Jags last year 35-28 in the district playoffs. With a boost of Cade Brennan’s brainpower. Under consideration: Downingtown East (0-3), Penn Wood (11-1), Academy Park (9-3), Radnor (9-3), Neshaminy (8-4), Upper Dublin (10-1), Pottsgrove (11-1), Quakertown (9-3).